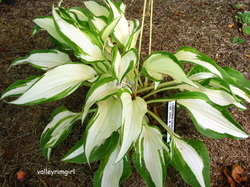 Mini - Mature size 4" x 12"
2" x 2" leaves with medium green-gray streaking between the green center and the creamy-white edge. 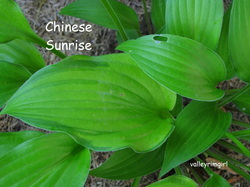 The leaf margin on the second flush of leaves is wider. H. 'Cameo' is the reverse of H. 'Pandora's Box'. Lavender flowers on 12" scapes. 5 vein pairs. Purchased in 2010. Picture taken mid summer 2011. 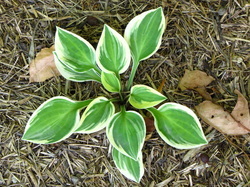 L - Mature size 23" x 42"
8" x 7" gold centered leaf with a darker and wider green margin and heavier substance than its parent plant the famous H. 'Gold Standard.' 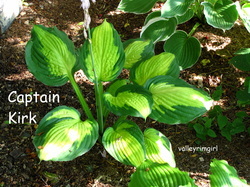 Does not set viable seed. Pale lavender flowers. Fast growing. Named for the commanding officer on "The Starship U.S.S. Enterprise" of Star Trek. Picture taken in August 2011 of my 3 year old plant. ML - Mature size 18" x 44"
9" x 7.5" glossy medium dark green oval heavily textured leaves with irregular 1.5" wide yellow to gold margins that change to creamy white that streak into a dark green center. Older leaves are intensely corrugated. Lavender flowers on 34" scapes. 10 vein pairs. 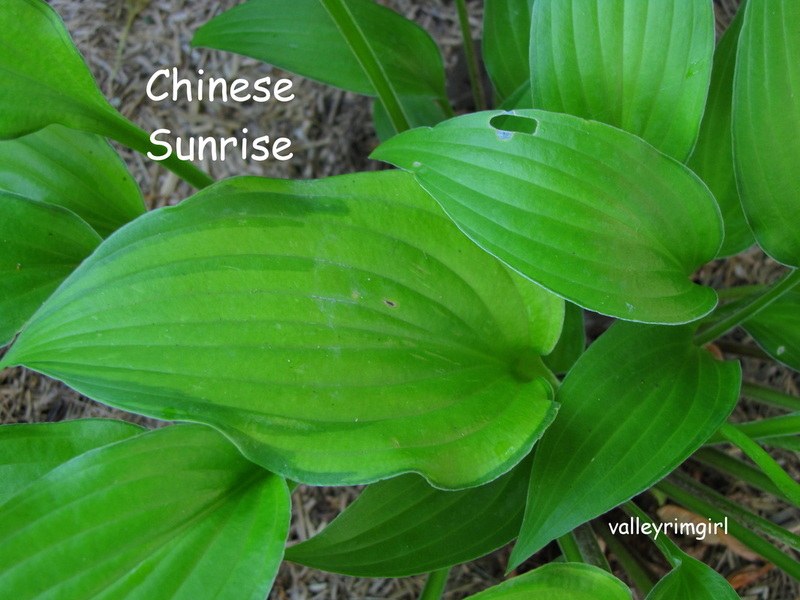 Shade to 1/2 sun. Growth average. 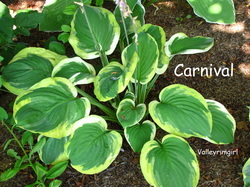 I purchased Carnival in 2008. This picture was taken in mid summer in 2011. 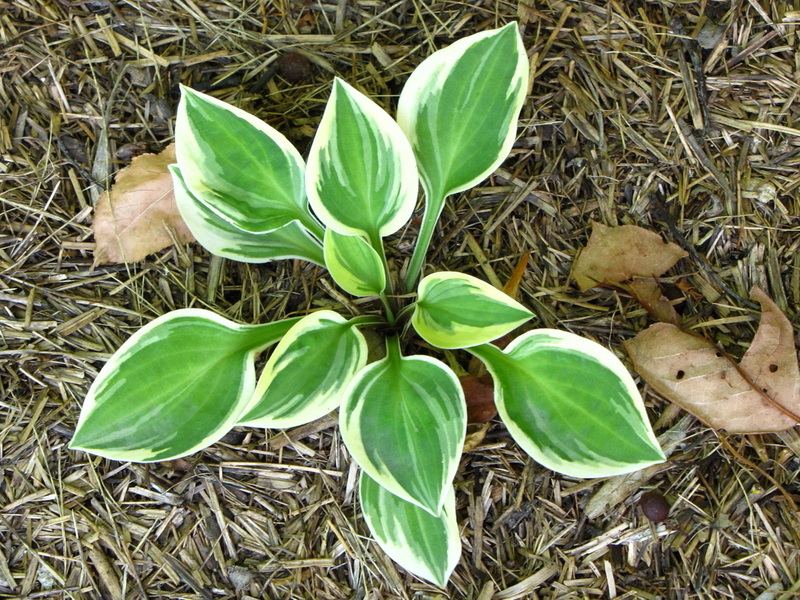 M - Mature size 14" x 35"
6" x 3" glossy thin textured leaves have a chartreuse to dull gold center with a narrow dark edge in spring. Mid summer it is a solid green. Medium lavender flowers. Very prolific. Tolerates sun. 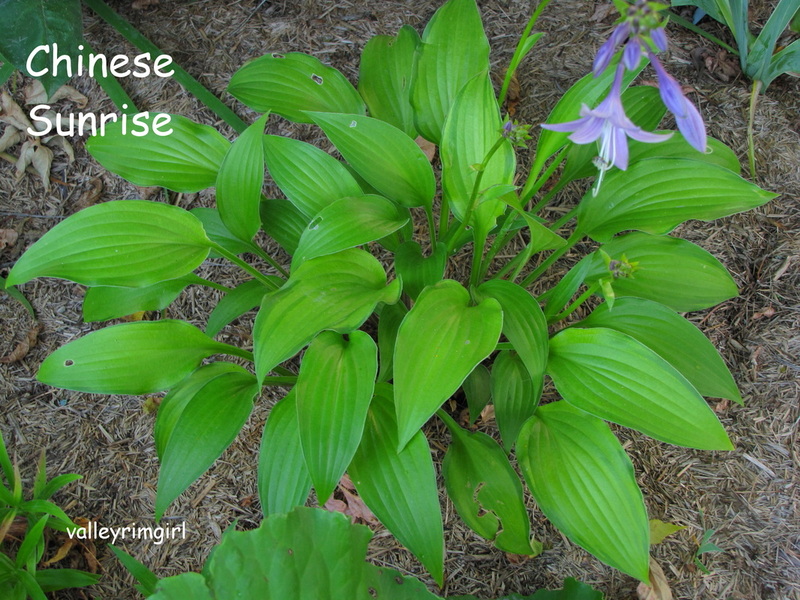 Can be used as a ground cover. Makes a thick neat mound. 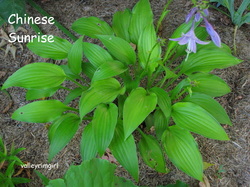 It is known to be one of the first hostas to come up in the spring. I received this hosta in trade in 2010 and it is doing wonderfully! 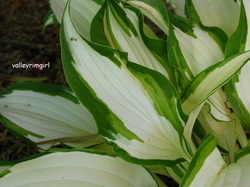 SM Maximum size 18" x 40"
9" x 5" hosta leaf with a very wide white center with a narrow green margin. 9 - 10 veins on leaves. Pale lavender flowers. 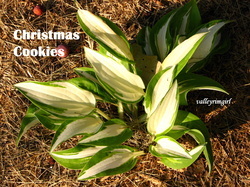 I purchased Christmas Cookies in 2008. This picture was taken the following summer. Close up of the leaves. Love the stark difference between the white center and the various green colors of the margin. Purchased in 2008. Picture taken in mid summer 2011.